Besides the fact TRACEROUTE has won numerous indie doc awards and has gotten fantastic reviews, you don’t have to be a Nerd or into Nerd culture to enjoy this film, in fact it may get you to understand it more. What makes TR great is that it is hilarious. Not rolling on the ground, crying, trying to catch your breath funny. But constantly laughing in your head because of the constant comedic comments by the director, producer, writer and and narrator Johannes Grenzfurthner. And while Johannes is covering a topic that has been covered a million times before, he brings originality to the film, by making fun of mundane documentaries, by filming this like a mundane documentary. (oh, and on a personal note, they stop at the Henry Miller museum in Big Sur, a place I have been). You will either really like this DOC, or you will be cursing me for wasting 2 hours of your life. Oh well. Traceroute is a 2016 Austrian/American documentary film directed by Johannes Grenzfurthner. The autobiographical documentary and road movie deals with the history, politics and impact of nerd culture. 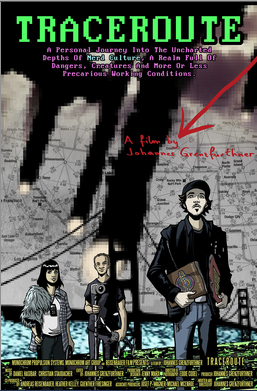 Grenzfurthner calls his film a “personal journey into the uncharted depths of nerd culture, a realm full of dangers, creatures and more or less precarious working conditions”, an attempt to “chase the ghosts of nerddom’s past, present and future.” The film was co-produced by art group monochrom and Reisenbauer Film. It features music by Kasson Crooker, Hans Nieswandt, and many others. A tracer is every 5th round fired from a machine gun. It glows red (US) or green (Chicomm) for aim toward a target. I’m thinking ‘TRACEROUTE’ is a sloppy aim to find the target before getting off track. Another fact: Chinese weapons are slightly bigger bore than US manufacturer. They can fire theirs and ours but we can’t fire theirs. We must blow up captured ammo because it jams if we use it. Special forces often carry Chinese AK-47’s because they can use captured ammo after they run out of ours.